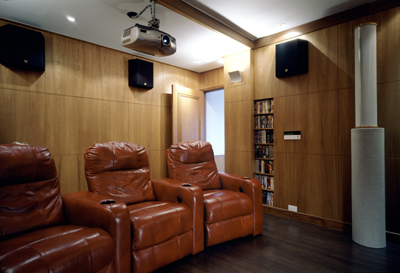 The proper placement of subwoofers in your home theater system is crucial to the quality of the desired sound. Placing them in the correct location creates a bass sound level smooth with frequency. The subwoofer generates very low frequency sounds. The size of these sound waves compares to the size of the listening room. If the subwoofer is placed in the wrong position in the room, we hear "room booms" instead of the musical bass scale. On the other hand, if we get the subs into the proper location, the bass sound level becomes smooth with frequency. Subwoofer extension into deep bass is achieved along with significant punch capacity. In this section of work, we will study both the good and bad placement positions for subwoofers located in smaller sized listening rooms, the kind most of us have. Bad speaker positions are those that allow the speaker to stimulate room resonance (modes). Good speaker positions are those from which the speaker cannot stimulate such "room boom" effects. These golden spots are called the anti-mode speaker positions. 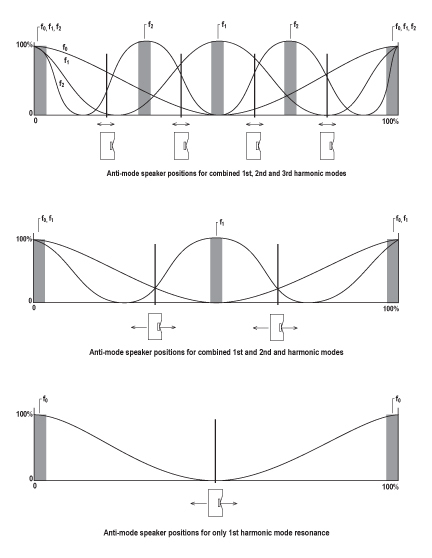 To gain some understanding of mode vs. anti-mode speaker positions, it will be very helpful to consider a one-dimensional acoustic space. In a regular room, sound can travel in any direction. If, however, the speaker was located at the end of a long, narrow pipe, the sound could only travel in one direction, along the axis of the pipe. A pipe is a one-dimensional acoustic space. If we plug up both ends of the long pipe, then the "boundary conditions" of a one-dimensional room are met. This is a similar idea to a room having walls. If the woofer is positioned at one end of the big pipe and a frequency sweep is delivered to it while a sound meter is positioned at the opposite end of the pipe, we will see evidence of the modes. At first, in the very low frequency (LF) range, there are no special changes in the sound level meter. Sooner or later, there will be some frequency where the meter needle gets pegged. The sound got exceedingly loud at this opposite end of the tube, marking the first or "fundamental" resonant frequency and mode. As the frequency sweep continues upwards, the meter level drops back to normal for a while, but finally peaks again. This next frequency marks the second resonance mode and is called the first partial or first harmonic. Curiously, the frequency of this second resonance is exactly twice that of the first resonance. We go up some more, only to find another resonance, the third resonance or second partial which is exactly three times the fundamental resonance frequency. This harmonic. Series goes on and on with this same pattern. Needless to say, if we moved the speaker to the opposite end of the pipe, exactly the same harmonic series would be developed. However, if the speaker were moved to the exact middle of the pipe, the first resonance would not sound out. Nor would the third resonance, the fifth, and so on. 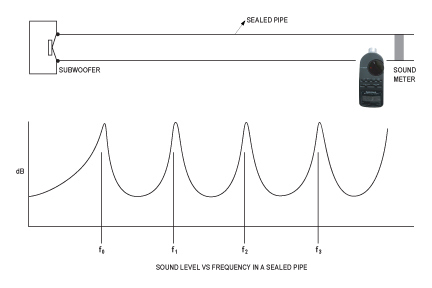 Odd numbered resonances cannot be stimulated in a closed pipe when the speaker is located in the middle of the pipe. From the middle of the pipe the speaker can only stimulate half of the total number of resonances available to the pipe, the even numbered resonances. This position dependent selectivity does not stop with the ends or middle of the pipe. Move the speaker to a position one third from either end or, presto, only the third, sixth, ninth, and so on harmonics can be stimulated. Then we move to a position one quarter of the pipe length from either end and are not surprised to find only the fourth, eighth, twelfth, and so on harmonics. And next the fifth ... and so on. The reason for harmonic selectivity is not in magic numbers, or any other form of audio voodoo. It's more like simple physics, otherwise known as the nature of things. A play set swing can provide a good example for this effect. As children, most of us learned to "pump the swing" by coordinating our leg/body action with the position, more accurately, the phase of the swing's position. It's all in the timing and it is pretty hard to explain, so we teach by showing. Monkey see, monkey do. If we can get the timing right, up we go, almost like magic. The swing system is a resonant system and a pipe filled with air is also a resonant system. Applying the right kind of force at the right place and time can pump either up. In a closed pipe, which has been stimulated into its first resonance condition, we will find that the sound is very loud at either end of the pipe and very quiet at the halfway point, the middle. These loud areas are called sound "pressure zones"; and, if the speaker is located in either of these pressure zones, it efficiently couples to and can pump up the resonant condition. Conversely, if it is not so located, it can't pump. The second harmonic of a closed pipe has three pressure zones, one at either end and one in the middle. If we located the speaker in any three of these pressure zones, we can stimulate the second harmonic. However, if we locate the speaker in the middle pressure zone, we cannot stimulate the first resonance but we can still stimulate the second one. Once the understanding of these variables has been made clear, it becomes easy to expect what will happen if a speaker is located in any particular location. It seems that no matter where a speaker might be located in a closed pipe, one resonant harmonic series or another will become stimulated. However, subwoofers are always rolled off just below the beginning of the vocal range, about 85 Hz. 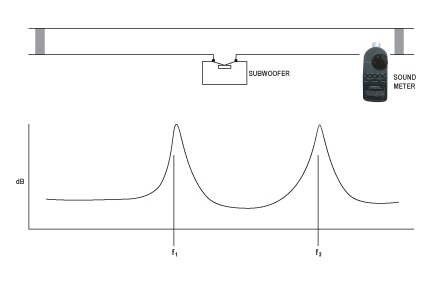 This means that the subwoofer cannot stimulate resonances above the roll off frequency. Now, if the first resonance is 25 Hz, the second will be 50 Hz, and the third 75 Hz. The fourth resonance will be at 100 Hz. The fourth resonance and all of those higher than it are above the 85 Hz roll off frequency of the subwoofer. This means that the speaker need only be positioned so that it doesn't stimulate the first, second, or third resonances. The speaker has to be located somewhere, but not at either end, not at the middle, and definitely not at the third waypoints. There is another factor that limits the remaining options for speaker placement. The pressure zone is not a pinpoint-sized space; it spreads out. If the speaker is located near enough to the center of the pressure zone, the resonance can still be stimulated. A pressure zone effectively extends about one quarter of the distance between adjacent pressure zones and the speaker should not be located inside the effective pressure zone space. For all practical purposes, the speaker should be located 25 percent away from the end of the pipe to best avoid stimulating any of its first three harmonics. There is no location towards the middle of the-pipe that suits a subwoofer position, as the pressure zones there are overlapping. A listening room can be approximated as if composed of three intersecting pipes. These pipes would lie along the three room axes -- front to back, side to side, and floor to ceiling. This means that the subwoofer location for best, non-resonant playback will be about one-quarter of the ceiling height off the floor, one-quarter the width of the room off the side walls, and one-quarter the room length off the front or back wall. When discussing speaker location, it is only the dimensions to the center of the driver cone that count. The location of the edge of the box really doesn't matter. No computer program is needed to properly position the subwoofer in a room; a tape measure is your only investment. Note also that the currently popular "rule of thirds" placement formula is not consistent with the understanding of an aresonant speaker placement. This over publicized "rule of thirds" would only be applicable if the subwoofer roll off was set so that the speaker did not play the third harmonic. The concepts of subwoofer placement have by now been well developed and now some practical applications can be considered. Two things need to be shown - the roll off frequency of the subwoofer and the first resonance frequency of each pipe axis of the room. Typical roll off is set at 85 Hz. The shortest dimension of a room is the floor to ceiling distance. If this dimension is eight feet, the first vertical resonance occurs at: 1130/2x8 = 70.6 Hz. The second at 141 Hz is well above roll off and can be ignored as well as any higher partials. The vertical position range for aharmonic playback will be to locate the subwoofer anywhere in the middle half of the room, keeping it at least two feet away from either he floor or ceiling. The next shortest distance in a room is the width, typically about 15 feet. The first resonance for this is 1130/2x15 = 37.7 Hz. The second is twice that at 75.4 Hz and the third is three times that or 113.1 Hz. The second harmonic is within the subwoofer range but not the third. 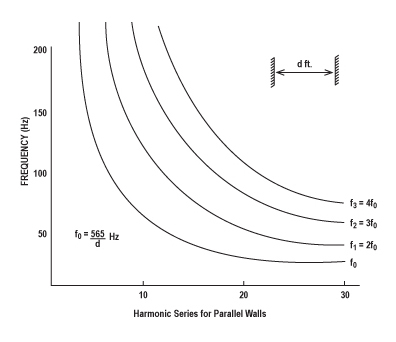 The sub has to be placed more than 25 percent away from the wall because of the first harmonic, but not in the central one-eighth width of the room due to the second harmonic. The sub can be located anywhere between three-quarters and 6-3/4 feet from the side wall. Lastly, the length of a room might easily be 21 feet long. The first resonance for this would be 1130/2x21 = 26.9 Hz. The second is 53.8 Hz and the third is 80.7 Hz. The fourth at 107.6 Hz md above are all well above the roll off frequency and can be ignored. For the length of the room, the sub position should be one-quarter of the room length or five feet off either end wall. So, a room 8 feet by 15 feet by 20 feet will have the smoothest bass if the piston of the subwoofer is located two to six feet off the floor, between 3-3/4 and 6-3/4 feet off the side walls, and five feet off the end wall. This is true as far as avoiding strong coupling of the speaker to the room modes, but there is more than modes to worry about as far as speaker smoothness is concerned. Incidentally, these silent areas located between the pressure zones deserve a little attention as well. They are "cancel zones" because sound is cancelled at these locations. Sound cancellation is being used a little more often these days, particularly with industrial noise control applications. Sound cancellation seems to possess a form of sci-fi lure for some people. The idea of beaming "anti-sound" waves to quiet freeway noise is one of the more popular of these energy-out-of-water type schemes. To the literal reader, words create reality. But to the engineer and scientist, reality exists independently from words. Just because someone can dream up a sentence that seems to make sense doesn't mean that it physically does make sense. Normally, sound cancellation applications remain limited to the control of sound in pipes. For example, if we take a closed pipe that contains a harmonic condition and drill a hole into the pipe, we will get varied results, which depend on where the hole is located. For the first harmonic, with a pressure zone at either end and a cancel zone at the middle, we can drill a hole into the pressure zone at either end and kill the resonance. But, if we drill through the wall of the cancel zone, there is absolutely no change in the resonant condition. A hole in either pressure zone allows pressure energy to leak out. But there is no pressure energy in a cancel zone, so a hole that leaks pressure doesn't affect anything. This is not news -- the ancients knew about it. The flute and clarinet type instruments use this open/closed hole effect to select pipe resonances, heard by us as notes. Let's consider what can happen if the closed pipe is engaged with its second harmonic. There are three pressure zones and two cancel zones. A hole could be drilled through the pipe wall at each cancel zone and not affect the existence of the resonance. Now we have made a closed pipe into an open pipe; and, if we blow air into one hole, it will come out the other hole. We have discovered a pathway to conduct air through a pipe filled with sound without having any of the sound leak out. With industrial sound canceling, the tonal sounds of a blower that moves air in a closed duct can be cancelled at an air outlet. One can use either this standing wave pipe process or a speaker/microphone/computer system to create this same sound canceling effect at the opening of the pipe. Although the sound at the opening can be cancelled, the sound elsewhere in the pipe is very loud. If two forces are applied equal and opposite, there is no force imbalance, hence no movement. That doesn't, however, mean there is no stress on the material. There is twice as much stress to the material than if only one force was applied. So it is with sound. If two sounds are applied equal and opposite, there is no sound at some point, but that doesn't mean there is no stress on the material. There is, in fact, twice as much stress in the material than if only one sound had been applied. If we move away from the point where there is no sound, we'll find twice as much sound everywhere else. That's the point. Sound cancellation doesn't mean sound energy cancellation. The energy is still there. In fact, it has become twice as strong. Just because we can't hear it at one location only means we will hear it twice as loud at another. This brings to mind freeway noise cancellation and many other sound cancellation schemes. The real rule for sound cancellation engineering is that if we arrange to not hear sound in one place, then to someone else it has become twice as loud. We always have to watch out where that loud zone has become located. If it is onto our neighbor's property, we might get sued. Sound is energy. We also know that energy plus energy equals more energy, not less. We can steer sound around somewhat by adding more sound, but we can't simply erase sound with "anti-sound" waves. Except, of course, in the imaginations of those who read and write sci-fi stories. Under certain conditions, a speaker can cancel its own sound. Consider what happens when a positive part of a sound wave meets a negative part of the same sound wave. We have sound cancellation. When a speaker is near a wall, sound from the speaker expands out from the speaker, impacts the wall, and rebounds back toward the speaker. At some certain frequency, the timing of the rebound wave will be exactly one-half a period of the tone. 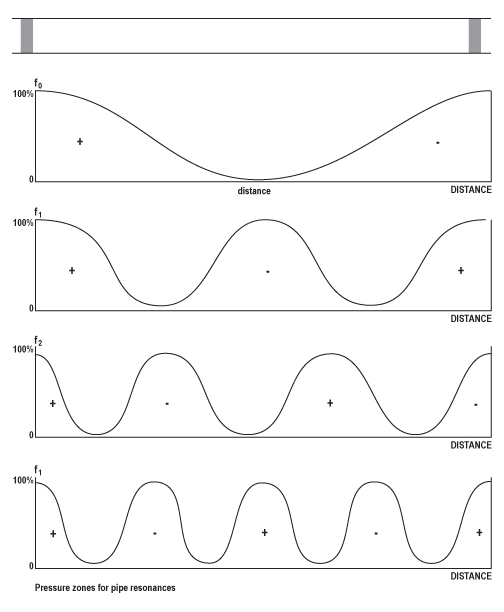 The period of a wave is exactly the time it takes for one cycle to occur. Middle C of the musical scale has the frequency of 256 Hz. That means the period takes 1/256 second to occur. A half period for 256 Hz would be 1/512 second. If sound could go from the speaker to a reflecting surface and back to the speaker in 1/512 second, the positive of the reflected wave would mix with the half-period-later negative of the wave at the speaker face and there would occur sound cancellation. The round trip distance covered would have to be 1130xl/512 =2.2 feet. A wall located 1.1 feet away from the speaker could reflect sound back to the speaker and create this self-cancellation effect. A single bounce is bad enough, sometimes creating a three to four dB reduction speaker output at and around the self- cancel frequency. But to have two walls reflecting waves back to the speaker at the same time is nearly intolerable. Whenever we have a speaker near a corner, there results three wall reflections, three corner reflections, and one tricorner reflection. In order to keep the self-cance11ing effect to a minimum, every one of these round trip distances should be as different from one another as possible. The most obvious setup is to keep the distances the three walls as different as possible. For our example room, the distance off the end wall had to be five feet. The distance off the side wall could also have been set up at five feet. We could have had two, ten-foot round trip waves impacting the speaker with a time delay of 10/1130 = 1/113 second. This would create the self-cancel effect to occur for a frequency whose period is twice that time or 2 x 1/113 = 1/56 second. This would be the frequency of 56 Hz which is well below the 85 Hz roll off frequency of the subwoofer. A better choice for the subwoofer position might be 2-1/5 feet up, 3-3/4 feet out from the side wall, and five feet off the end wall. A graph can be used to help with this latest decision whenever there is a range of speaker positions available. For any axis in which the third harmonic is engaged, the speaker position is fixed at 25 percent. There is flexibility in speaker position for any axis that only engages the first or second harmonic. Outside of keeping the three dimensions as different, as far apart as possible, there is one other detail. We need to keep the bicorner bounces from overlapping the wall bounces. The only opportunity for trouble here is if the distance to the corner formed by the two shorter dimensions equals the third longer dimension. To use the timing graph provided here, you darken the arcs whose radius equals the fixed, third harmonic, 25 percent dimensions. Then you darken the straight lines that correspond to the ranges available in speaker placement for the other, lower harmonic axis. For our example, the room length engaged the third harmonic and the distance off the back wall became fixed at five feet. An arc with a five-foot radius is darkened on the graph. The width and height of the room were not long enough to engage the third harmonic. The corresponding ranges for speaker placement are plotted on the graph, one axis for each graph axis. It doesn't matter which room axis goes on which graph axis. Here, the side wall was placed on the vertical axis and the height range was placed on the horizontal axis. 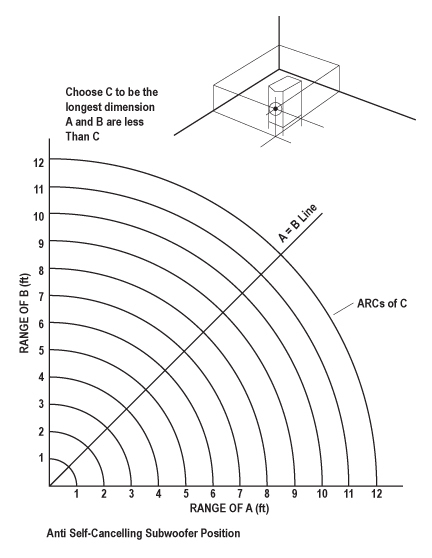 The result is a rectangle with an arc passing through the lower corner. The distance off the floor and side wall can take any pair of values inside the rectangle, except those on or close to the arc. They also shouldn't be equal to each other, so the pair of values needs to stay away from the "equal" line on the graph. There is another consideration. Subwoofers sound weaker when played out in the open and stronger when played near sound reflecting surfaces. 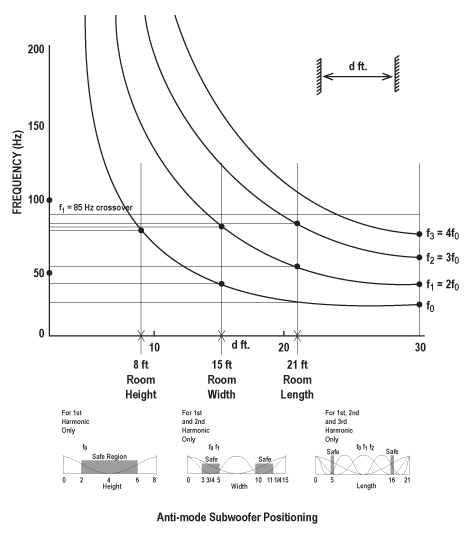 This wall or floor loading effect is a form of horn loading which always makes low-frequency speakers more efficient. In addition, we elected to keep the sub as close to the side wall as possible, out of t, he middle of the room. The coordinates of 2 to 2-1/2 foot height and 3-3/4 off the wall meets all of our requirements. Subwoofer setup is usually accomplished by listening to music, inching the box around the room, and trying to find the smoothest location. This sport is more like fishing than anything else, to be specific, bass fishing. What we have tried to do here is debunk some of the practices of audio voodoo, reduce your dependency on the audio personality or guru, limit your searching for magic numbers, and the purchase of guru computer programs. We have tried to replace them with simple graphs, the otherwise desperate and often misdirected groping for that elusive, but real, subwoofer sweet spot.